Cordillera - "It was the best bread I have had in the Philippines. It was like European bread", that was the statement of Jun Jun when he first tasted the bread of 'Ma'am Jane' in her bakeshop in Sagada. Jun Jun was the travel buddy of Canadian vlogger Kyle Jennerman popularly known in his local name as "Kulas". They are currently traveling north of Luzon and they are now exploring Cordillera particularly Sagada, Kalinga and the Mountain Province. On their journey into Sagada town, they were accompanied by their local tour guide ma'am Jane who happens to have a bakery business in town. Jane took them to her bakeshop to try out some of her handmade bread. 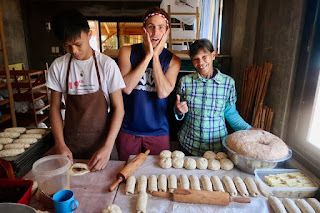 "It could be some of the best bread in the Philippines," this was Kulas reaction after eating some of Jane's bread. "100% MUST TRY! Especially when fresh (usually around 2-3 pm everyday). Jane makes chocolate, blueberry, cheese, vegan, and cinnamon raisin breads... All 100% handmade with natural ingredients, no preservatives, and no "cheap additions". Jennerman wrote in his FB page BecomingFilipino. Kulas later learned that ma'am Jane was a former OFW who had worked in Israel for 11 years. She came back to Sagada, trained how to bake with a french baker and later she started her own little bakery in Sagada. Frankston Mayor Hampton shakes hand with newly appointed Youth Mayor Gerard Felipe. Photo Courtesy || Frankston City Council FB. Cordillera - 19-year-old Gerard Felipe was very excited and rapt to take on his new position as the new Youth Mayor for the municipality of Frankston, Victoria, Australia. Gerard Felipe was a proud Igorot and Cordilleran from Tublay, Benguet. In his message on Facebook, Gerard thanked everyone who supported him and also very proud of being an Igorot. 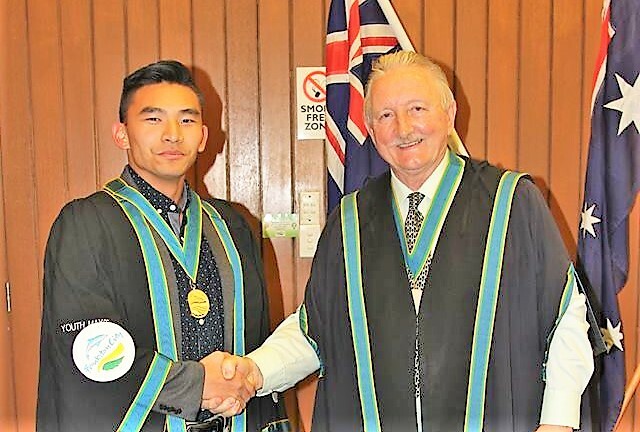 "I am proud to serve as the first youth Mayor for the municipality of Frankston, Victoria, Australia as an Igorot", Felipe wrote. "I continue to take pride of sharing our rich culture abroad, and look forward to encouraging the youth within the community to reach their highest potential. But most importantly, I will never forget where I come from. " Felipe will serve for 12 months working together with the local community and local government of Frankston as part of the program designed to allow the youth aged from 18 to take an active role in the community. Part of his role as youth mayor is to meet regularly with the youth council and attend regular council meetings, as well as working with the youth council to address youth disengagement, bullying and mental health. On taking his new role as youth mayor, Felipe said he was motivated by Gandhi's quote: "Be the change you want to see in the world." His inspiring message to the youth: "Be informed and don't be afraid to speak up for what you believe is right." Frankston's Mayor Colin Hampton was optimistic about Felipe role, "Gerard is sure to be a fantastic representative for Frankston City's local youth and I look forward to working with him". "Gerard sees the youth mayor role as a great opportunity for young people to be heard with programs for youth to be more involved and active within local community," Hampton added. Oliver Oliem from Atok, Benguet recognized during the PCQC awarding ceremony at Hotel Supreme. Photo Courtesy || PCQC FB page. Baguio City - The locally grown Arabica coffee in Benguet emerged as the champion and named as the best coffee in the Philippines during the 3rd Philippine Coffee Conference held in Baguio City on March 21- 22. 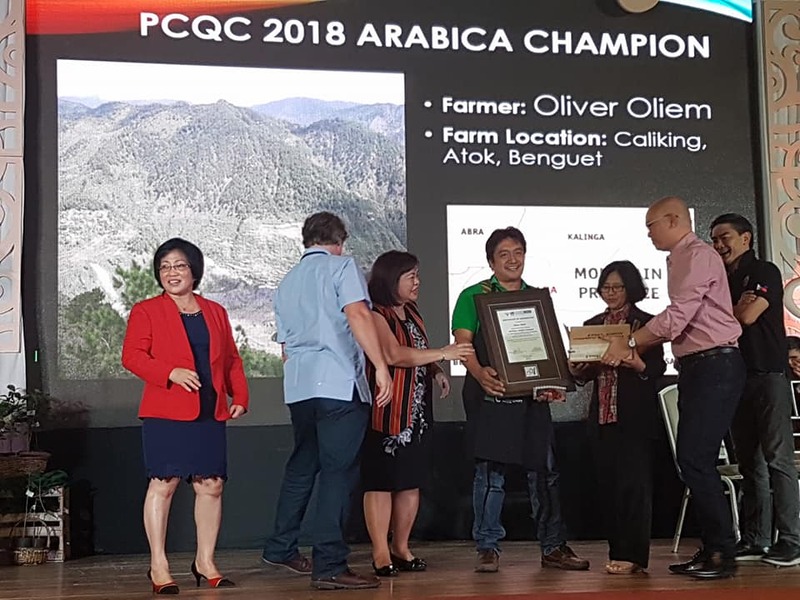 The Arabica coffee entry of Mr. Oliver Oliem, a coffee farmer from Caliking, Atok, Benguet topped other regions in the country in terms of coffee quality. Oliem entry got a grade of 87.06 from the judges who unanimously voted for the Arabica entry and said the coffee beans were exemplary because it has blends that has a characteristics of Apricot, lemongrass, Pomelo, Oolong Tea and aroma of a Rose. One of the judge Shaun Ong from Singapore, said the high-rating of the coffee quality is testament of the improving coffee quality in the country. "There is a dramatic increase of quality and it caught the judges, wondering what has been happening on the ground. Competition helps producers realize there is market for quality coffee. Anything above 80 should already be applauded." Ong said. Other winners from Benguet were the coffee entry of Restie Labi Tacio, also from Caliking, Atok, who got the third spot and Belen Macanes from Sagpat, Kibungan, who was ranked fifth place. Winners of this year's coffee competition were recognized during the 2018 PCQC awarding ceremony at the Hotel Supreme. Co-organized by the Department of Trade and Industry (DTI) and other Philippine government agencies including US based institutions, the PCQC aims to give recognition to farmers who showcase excellence in coffee growing, and to encourage others to push for product development. Lead judge Charlie Habegger, a specialty coffee buyer for Blue Bottle Coffee from USA and Asia said "Competitions are important because we identify those coffee and we could share those coffee as an example". "Judges from different cultures, palletes, experience, perspective can agree on example of great quality that is really significant", Habegger added. Cordillera - The North Cagayan International Airport also known as Lallo Airport located in Cagayan province has successfully launched its first Inaugural commercial flight from Macau on March 23. The P.1.67-billion new airport in Cagayan will be catering different international flights to Macau and other destinations in China in a regular basis by the fourth quarter of this year, following the installation of important navigational tool for pilots to help them acquire safe landing, according to Raul Lambino, administrator of the Cagayan Economic Zone Authority (CEZA). 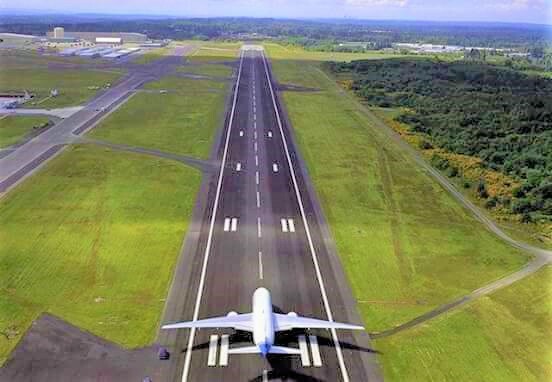 The airport which is managed by the Cagayan Premium Ventures Development Corporation, a joint venture company developed by CEZA and a private company is now expected to accommodate bigger aircraft like the Airbus 320 and Boeing 737 that can cater international tourists coming to visit Northern Luzon. Following its successful inaugural flight, the airport can provide many different aviation services such as park and hangar club, aircraft maintenance repair and overhaul, test flight for schools offering aviation courses and other services. The airport can also be used by the Philippine Air Force as their Northern Luzon Hub. 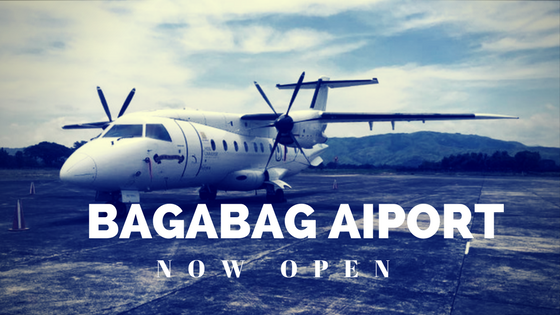 But, the main plan for the airport, according to Lambino is to establish an open gateway to serve regular flight for local tourists and international tourists visiting Northern Cagayan, Apayao and Ilocos Norte. The airport also expects to serve domestic flights starting in April this year to accommodate local tourists coming from different places in the country to visit North of Luzon. Cordillera - Philippine newest YouTube vlogger (video blogger) Finn Snow has released this week some of the videos he took and documented when he traveled in Northern Luzon particularly in Kalinga province. 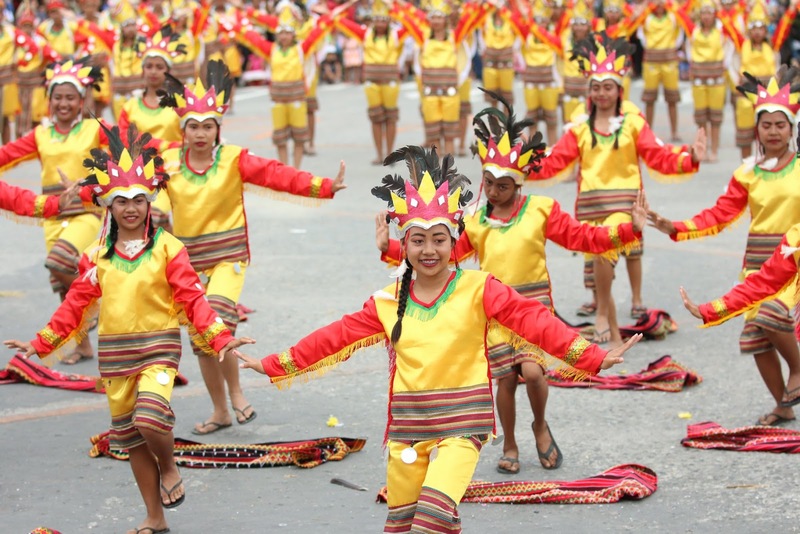 In his latest uploaded video entitled 'Real Life Head-Hunting Tribes Coming Together', he documented Kalinga's second Bodong Festival this year in the capital city of Tabuk. The Bodong Festival highlights several street dancing competition, grand street parade participated by different municipalities and organizations. 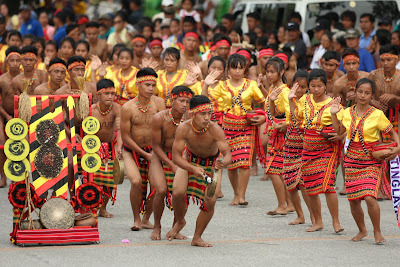 Armed with his camera, Finn Snow joined the parade while vlogging about the events and discussing what he learned about Kalinga's ancient head-hunting practice and 'bodong' which is the Kalinga's unique way of settling disputes between warring tribes. Snow learned that long time ago the people of Kalinga is "one of the most hostile, skillfull headhunters and tribal warriors in the whole Philippines. 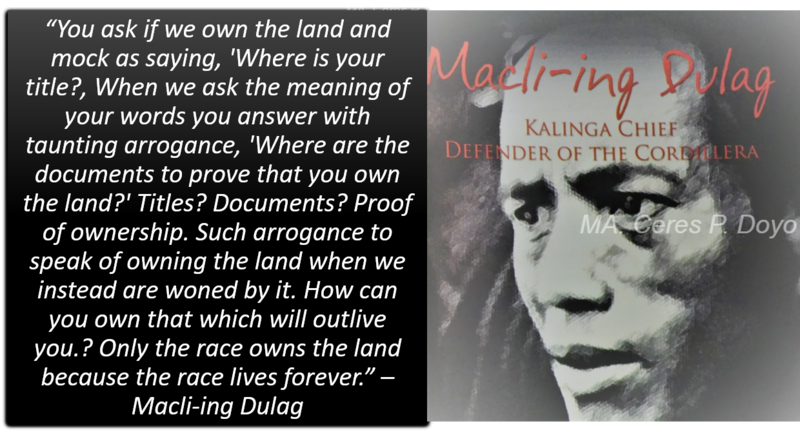 "There's not much places in the world that you can actually experienced the culture and the long long tradition of beautiful and brutal history of the Kalinga headhunters... But now they are having a festival bringing all together...", Snow said. "Being a foreigner here knowing nothing about this place and experiencing for the very first time, getting and sucking all that information about this area Kalinga, it makes me 'goosebumps' because there's not much places on earth that you can find this kind of old tradition of warriors and fearsome people,'' he added. Watch the Finn Snow vlog below. 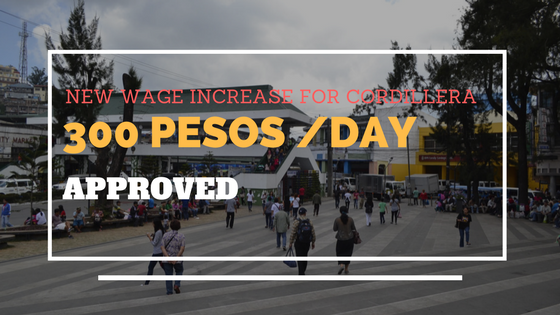 Cordillera - A local construction firm affiliated with a US-based solar-powered surface transportation system manufacturer has offered to conduct a feasibility study on the viability of running a solar-powered cable cars in the city. According to Aileen Refuerzo, city information office chief, Mayor Mauricio Domogan had received an unsolicited proposal from Ryanx Construction and General Services, a local representative of US-based firm Transit X LLC to conduct the said study. Domogan welcomed the proposal made by Rufino Barinan, chairman of the firm and had tasked the city legal office to draft a memorandum of agreement for the study that would be done at no cost to the city. The study that will be conducted by the local firm will include the identification of suitable areas for the alternative transport and acquisition of right-of-way easements and air rights. It will also include the environmental impact assessment of the project, as well as the effect on the livelihood of public utility vehicle operators in the city. According to Transit X website, the solar-powered cable transport is a "fully-automated transportation network with high-capacity interchanges and stops that provide fast and wait-free travel." 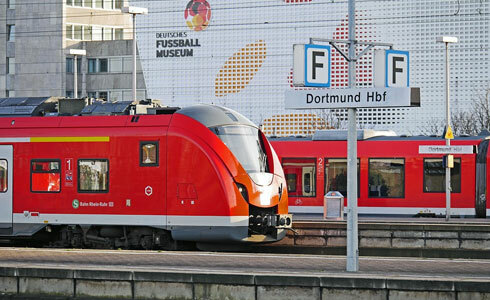 "Pods, each carrying a single passenger or up to a family of five, quietly cruise above traffic under a narrow tract. Destinations are entered via smart phone or kiosk prior to boarding. Passengers board pods at stops that are as convenient as taxi or bus stops. A pod takes off and cruises nonstop until landing at the destination." 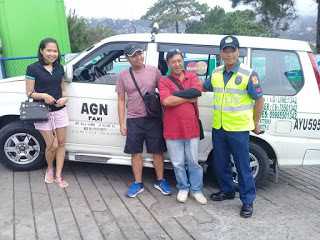 If the proposal will push forward up to its construction, Baguio City will be the first in northern Luzon to have established an eco-friendly cable car transport. 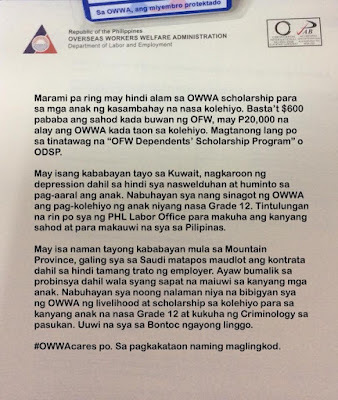 Cordillera - The Overseas Workers Welfare Administration (OWWA) is calling once again all OFWs to avail of the programs designed for Overseas workers who are in need of help and assistance. OWWA Administrator Hans Leo J. Cacdac said, there are still many OFWs who are not aware or informed about the programs that they can avail such as the 'OFW Dependents Scholarship Program' or ODSP and Livelihood Assistance. In his latest FB post, Cacdac mentioned two OFWs who were granted livelihood assistance and scholarship assistance for their kids who are going to college. 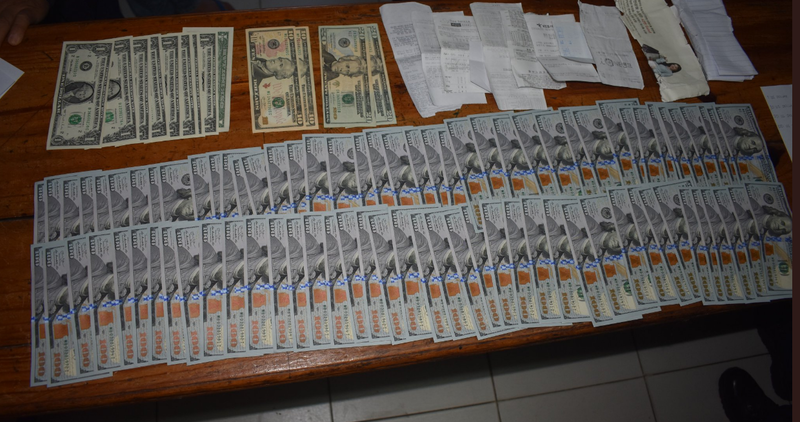 Cacdac cited a story of an OFW from Mt. Province who was hesitant to go home because she doesn't have enough money to bring home after her job contract in Saudi was stopped due to maltreatment from employer. "May isa tayong kababayan mula sa Mountain Province, galing siya sa Saudi matapos maudlot ang contrata dahil sa hindi tamang trato ng employer. Ayaw bumalik sa probinsya dahil walang sapat na maiuwi sa kanyang mga anak. Nabuhayan siya noong malaman niya na bibigyan ng OWWA ng livelihood at scholarship sa kolehiyo para sa kanyang anak na nasa Grade 12 at kukuha ng Kriminology sa pasukan. Uuwi na sya ngayong lingo"
The ODSP or OFWDSP is an educational assistance provided to qualified active OWWA-member who want to pursue any 4 to 5 year baccalaureate degree or associate degree in any state college or university in the country. Beneficiaries of ODSP can be granted financial assistance worth P20,000 per year provided that the OFW's income per month is less than $600, according Cacdac. Another program is the enhanced "Balik Pinas! Balik Hanapbuhay" where in returning OFWs are granted cash assistance worth P20,000 including entrepreneurship development training to equip them with the necessary knowledge to start their own business at home. To avail of the program, OFWs are advised to apply at any OWWA Regional Offices nearest their residence. 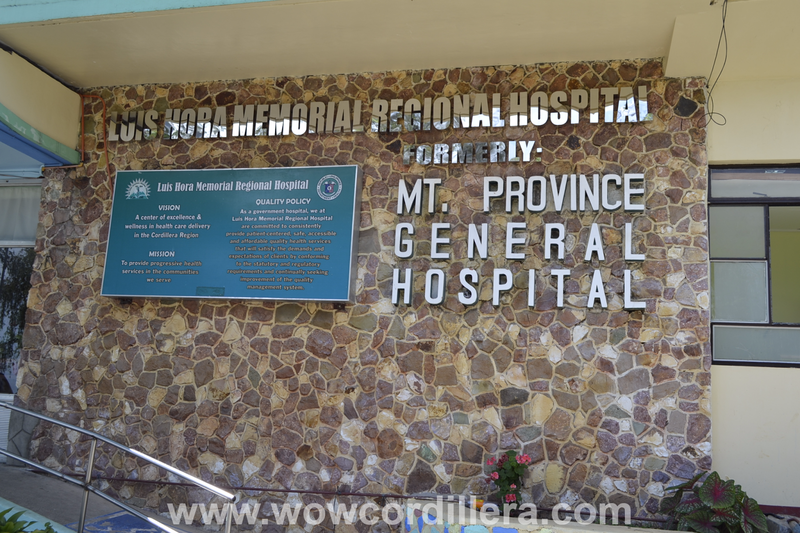 For Cordillera region, the regional office of OWWA is located at #17 Manongdo Building, Private Road, Magsaysay Avenue, Baguio City. You can also ask question by messaging them at their OWWA Baguio Facebook Page. Team Lakay's Kevin Belingon, Honorio Banario and Gina Iniong. Photo Courtesy || Benjo Andaya FB. Baguio City - They are among the best knockout artist in the ONE Championship MMA sport today, both Team Lakay's Kevin "The Silencer" Belingon of Ifugao and Honorio "The Rock" Banario of Benguet will deliver yet another exciting fight this April 20, 2018 at the Mall of Asia Arena. ONE Championship, the largest global sports media property in Asian history described Belingon as "one of the country's most talented martial artist". It says, he is a Filipino champion and former world title challenger who is known to have the "ability to finish opponents in a variety of methods". 29-year old Belingon has a professional record of 17-5 which seven of his victories came from huge knockouts. ONE Championship dubbed him as "the most feared strikers" in the history of ONE Championship's bantamweight division. This 20th of April, Belingon will headline the main-event dubbed 'Heroes of Honor' against 28-year old Andrew Leone of Cortland, New York. Another talent of Team Lakay is "The Rock" Banario who will be going toe to toe with Adrian Pang. Banario has been one of the Philippines' most respected martial arts veterans and his tremendous cage experience has brought him all over Asia in many memorable battles against top divisional talents, according to ONE Championship. Armed with his striking strength and his vastly-improved grappling skills, Banario is more than ready to showcase his world-class wushu skills and lightning-quick strikes against Australian Adrian Pang. ONE:Heroes of Honor will also feature martial arts contender Gina "Conviction" Iniong of Team Lakay. She is a six-time national wushu champion with a professional recod of 6-3, with four of her six victories coming by thrilling finish, including two highlight-reel submission and two knockouts. She will be facing former world title challenger 27-year old Jenny Huang of Chinese Taipie. 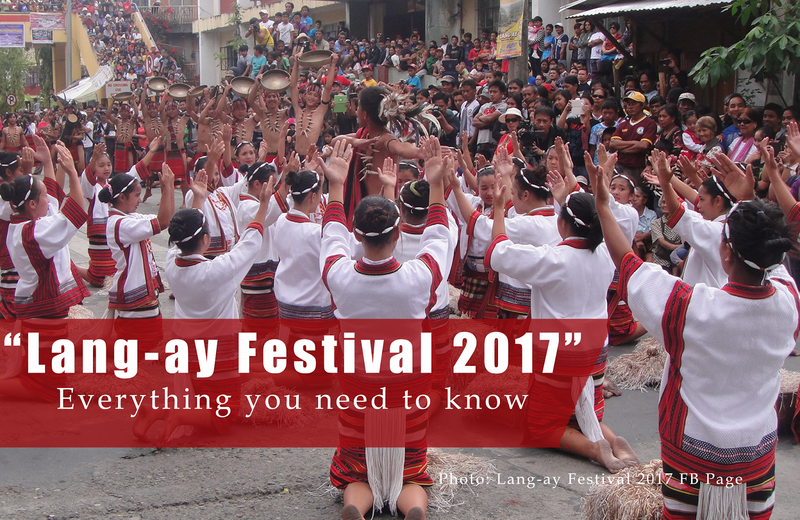 Baguio City - A team of Information Technology (IT) students taking up programming course from the University of Cordilleras (UC) has won award in the recently concluded programming competition of the third Philippine Programming Competition (PPC 2017). The team bagged the 4th place in the said programming contest which was organized by Gurango Software Corporation through CodersGuild.NET and in partnership with the Department of Information and Communications Technology (DICT) and National ICT Confederation of the Philippines (NCIP). One student in the team is the top scorer besting 60 participants from universities all over the country. The PPC is an annual programming competition that aims to identify talented entry-level programmers in the country by utilizing an automated assessment tool, localized for the specific needs of the Philippine software industry. The PPC has opened the competition to all 3rd and 4th year college students taking up courses in programming. For this run of the competition, participating student teams composed of ten (10) members representing colleges and universities from different parts of the country, took the PPC 2017 examination individually. Individual scores per team were tallied and six teams with the highest average score were named finalist. 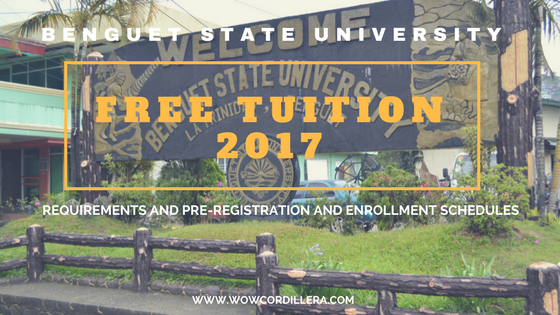 The six colleges and universities that got into the final were Holy Angel University, Technological Institute of the Philippines-QC Campus, University of the Cordilleras, University of Cebu-Banilad Campus and Cebu Institute of Technology-University. The competition 1st placer was a IT student team of the Technological Institute of the Philippines - Quezon City Campus. 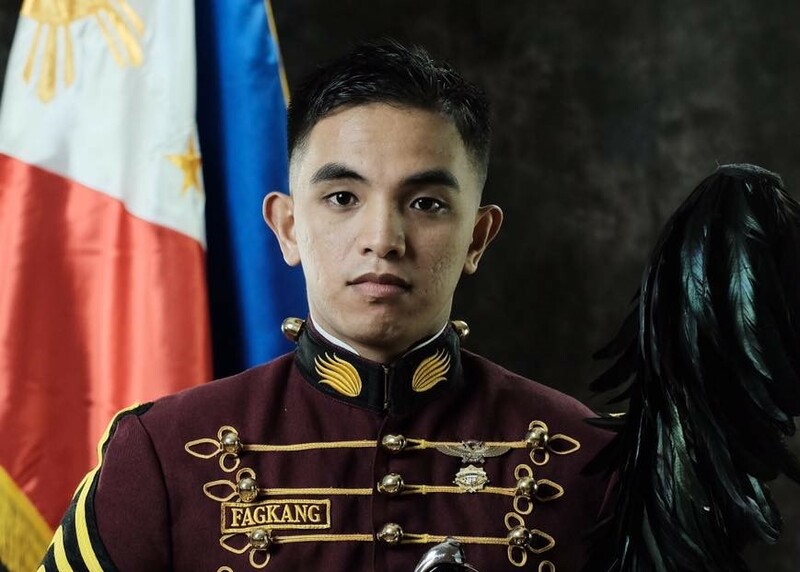 Baguio City - Two Cordillerans from Barlig, Mountain Province and Camp Allen, Baguio City are among the Top Ten who will graduate from the prestigious Philippine Military Academy (PMA) ALAB TALA (Alagad ng Lahing Binigkis ng Tapang at Lakas). Cadet 1CL Ricardo Witawit Liwaden from Barlig, Mountain Province is the top 2 of the graduating class. 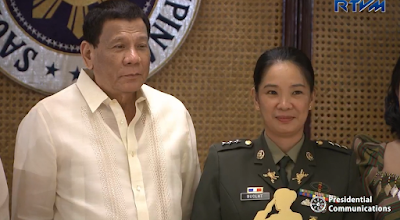 He will receive the Vice Presidential Saber award, Philippine Army Saber Sports and Physical Development plaque, Tactics Group award and Athletic Saber, according to PTV Cordillera. Meanwhile, Cadet 1CL Paolo Balla Briones from Camp Allen, Baguio City is in top 8 of the graduating class. A total of 282 composed of 207 male and 75 female cadets who joined the Philippine Military Academy (PMA) ALAB TALA class will graduate on March 18 with President Duterte as the guest of honor. Each PMA cadet will be guaranteed a military career as an officer in the Army, Navy or Air Force upon graduation. 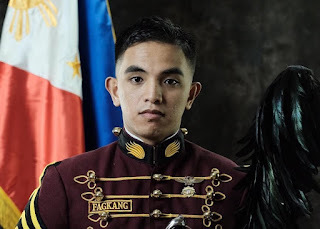 This year's PMA graduation rights will be lead by topnotcher Cadet 1CL Jaywardene Galilea Hontoria from Iloilo. He will receive the Presidential Saber, Chief of staff saber, Philippine Navy Saber, Academic Group award, Australian Defense Best Overall Performance award, Spanish Armed Forces Award and others. Cadet 1CL Micah Quiambao Reynaldo from Tarlac - top 10. 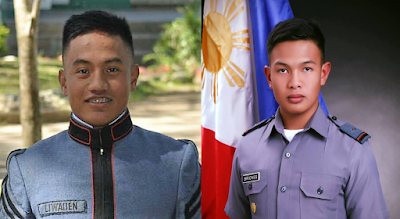 Police Cadet Francis Pang-ay of Sadanga, Mountain Province is ranked top 2 of the graduating class. Photo from || Harley Palangchao FB. Cordillera - Three Cordillerans ranked among the top 10 graduates of Philippine National Academy's PNPA Maragtas Class of 2018. Police Cadet Francis Pang-ay of Sadanga, Mountain Province is ranked top 2 of the graduating class. He is the class salutatorian of the PNPA Maragatas Class of 2018. Prior to his current place, he was also ranked fourth place in the 2014 Criminology Board Exam. 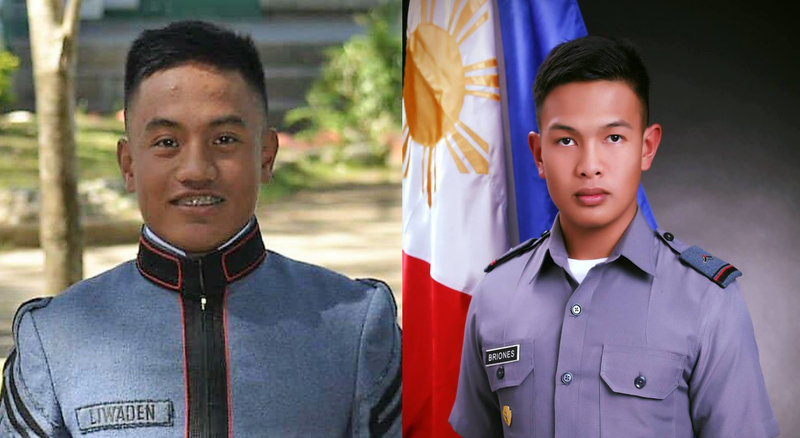 The other two sons of Cordillera in top 10 are Police Cadet Jess Torres Agustin of Kabayan Benguet in rank 3 and Fire Cadet Myrick Aquino Paldingan of Mankayan Benguet in rank 5. On Monday, PNP Chief Ronald 'Bato' dela Rosa presented to the media the top 10 graduates as he urged them to join the elite Special Action Forces (SAF) to help the government's fight against terrorism. "Isasabak natin ito sa Special Action Force lahat. Giyera muna kayo, giyera. "Wag muna kayo pahayahay," Bato said. There are a total of 106 cadets, composed of 97 males and 27 females who will graduate on March at the PNPA in Silang Cavite. The top 10 cadets are led by Police Cadet Fritz John Napalinga Vallador from Negros Occidental, as the class valedictorian. Cordillera - They call their group 'Baguio J Krayonz, a dance performers from Baguio and Benguet. In front of the four judges of the Pilipinas Got Talent (PGT) and to the thousands of viewers around the country, they proved that Igorots are truly talented and they too are world-class performers. All the four judges simultaneously voted a resounding yes after their performances followed by loud applause and cheering from the audiences. 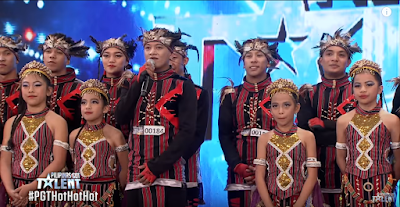 Judge Vice Ganda and Robin Padilla like the performance and were impressed after knowing that an indigenous music and dance can be integrated to modern dance and produce a fantastic result. "Gusto ko, kasi pwedi pala yun, yung gagamitin natin ang katutubong tugtug at musika... ng hindi nakakabawas ng performance. At tsaka yung grupo niyo madaling tandaan... kasi you embraced your ethnicity. Congratulations! ", Ganda said. Robin Padilla was also amazed of the performance and felt proud of the group for showing their culture in Manila. "Ang galing ninyo. Naipakita niyo sa tiga Manila ang kultura natin at higit sa lahat napatitig sila at napangiti sila kasi hinaluan niyo ng modern. Ang ganda ng fusion. Swabee!" Padilla commented. Judge FMG was also impressed of the group costumes and said he is pleased because the group is proud of being a Filipino and an Igorot. "I like the performance and congratulations, you did it very well." FMG told the group. The four judges simultaneously voted yes to the Baguio J. Krayonz which allows them to go through to the next level of competition. Baguio City - The United Kingdom and the Philippine government has forged a deal that will soon allow Filipinos to earn joint and dual degrees from top universities in the country and in the United Kingdom. This is made possible through the Joint Development of Niche Programme (JDNP) by the British Council and Commission on Higher Education (CHED). Through seed funding and institutional capacity building, this programmed aims to build long-term collaboration between Philippine and UK universities and established transnational education (TNE) within the country. Saint Louis University (SLU) and other nine universities in the country has been selected to develop new and innovative degree programmes under TNE. SLU in partnership with UK's Coventry University will offer an initial course in disaster risk reduction management, according to SLU Vice President for Academic Affairs Jose Maria Pangilinan. Citing the region's geographical terrain, the university recognizes the need to respond to the situation by conducting studies and researches on disaster risk reduction management. 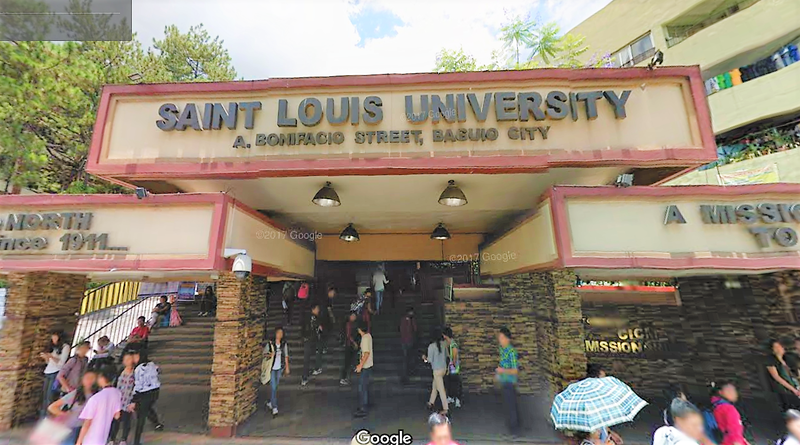 Aside from SLU, other higher education institutions with United Kingdom educational linkages are the University of the Philippines(UP) Diliman, UP Los Banos, University of San Carlos, De La Salle University, Miriam College, Siliman University, Ateneo de Manila University, Central Luzon State University and Bicol University. Last week, British Ambassador visited SLU as part of the "Great British Festival 2018" which was recently launched on Feb. 16 in Manila to showcase best British culture. UK's Ambassador to the Philippines Daniel Pruce has met with students, faculty members and university officials of SLU and told them the partnership between UK and the Philippines could boost relationship of the two countries. The new collaboration between UK and the Philippines will open new opportunities for students to gain access to best of Filipino and British education system, according to Ambassador Pruce. 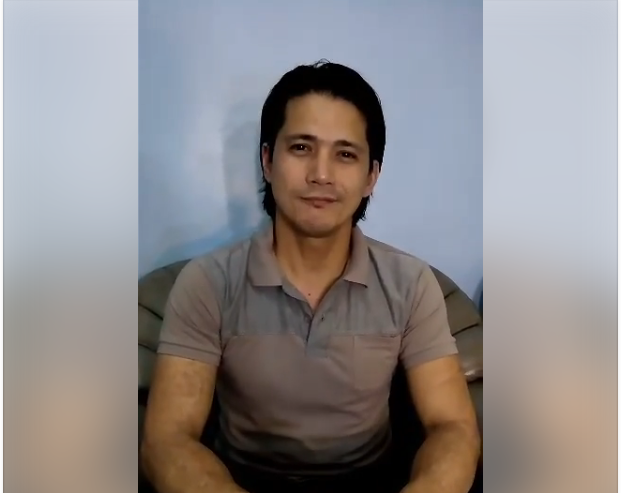 Cordillera - Veteran actor and producer Robin Padilla has a message to the people of Kalinga, praising them as the courageous tribe in the Cordillera. 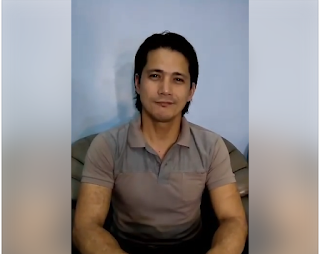 In a video that was uploaded by Diadem Joy B. Baliling in her FB account, the actor was recorded telling his message to the iKalingas especially to Apo Whang-od, wishing her to be included as a national artist. Padilla expressed his admiration to Apo Whang-od on her talent in tattooing. Last year the National Commission on Indigenous People (NCIP) said it has endorsed Whang-od as a national artist because her art of tattooing is part of Cordilleran culture. She has also imparted her knowledge to younger generation. Read Also: Apo Whang-od finally meets her idol Coco Martin of "Ang Probinsyano"
Whang-od is considered as the oldest traditional "mambabatok" or tattoo artist in the country. She uses an old traditional method of tattooing where she incorporates the use of ink from the mixture of charcoal and water and use citrus tree thorn to imprint through skin. "Mabuhay sa mga kailian ko jan sa Cordillera, Syempre lalong lalo na sa tribo ng Kalinga. Yan ay ating matagal ng nakasama sa Baguio. 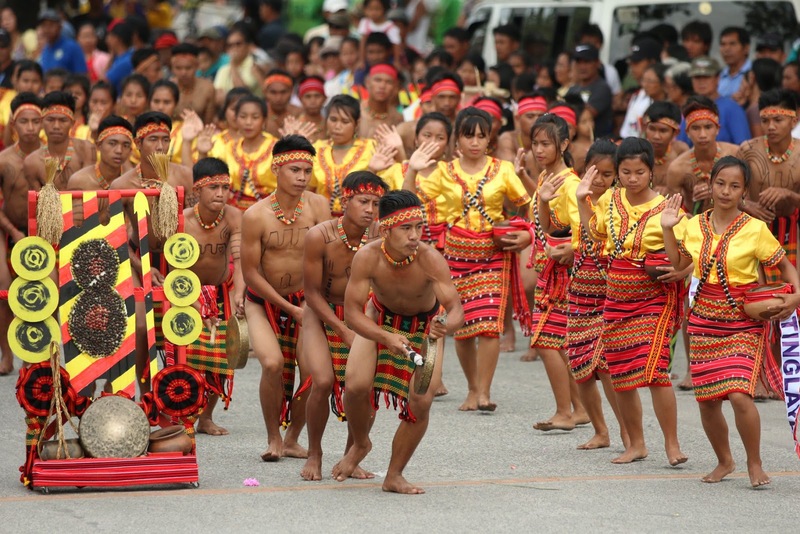 Yan ang mga masasabi nating mga matatapang at yung mga pinangangalagaan nila yung kanilang kultura bilang Igorot. At ako sympre ay nagpupugay kay Apo Whang-od. Ako po ay talagang, syempre po, bukod po sa akoy may dugong Igorot, ako po ay talang nagpupugay sa inyong talino Apo. Lalo na po, syempre, may kinaliman po sa pagtatao ng ating kultura. Kayo po ay talaga naming tinitingala at dapat po dumating ang panahon na kayo po ay hirangin na national artist."